It is simple to make your own floating candle holders at home. This can be a great way to make your own unique candle displays as well as saving money. Floating candles are an attractive form of wax candle. The candles are specifically designed to float on water in a vessel. This means that as well as providing natural candlelight, the flame dances on the surface of the water adding additional decorative features. When displayed in an attractive floating candle holder, the results can be stunning. While it is possible to buy suitable candle holders, it is also simple to make your own floating candle holders at home. This is a good low-cost alternative to buying candle holders and is also a great option if you are looking for something a little different. Champagne glasses - these can make elegant displays for weddings. Position them in a group for a stunning centerpiece display. Glass vases - these are typically tall and offer plenty of opportunity for adding further decorations, either by adding items into the vase or wrapping ribbon or other decorations around the vase base. 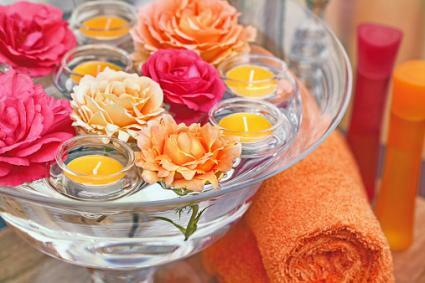 Bowls - any form of waterproof bowl can be used to make a holder for floating candles. Large fruit bowls are a good choice and are ideal for displaying a number of floating candles. Recycled items - glass jars or containers can be recycled for use as holders for floating candles. These can be dressed up by the addition of glass paint or glass beads. When using recycled items remember to check that there are no flaws in the glass. This can result in the glass shattering and could be a safety hazard. Size of the floating candles - it is essential that there is plenty of room around the floating candle so it does not touch the walls of the candle holder. If you are making a small candle holder from a wine glass or small jar then make sure that you look for small floating candles to display in it. Number of candles - how many floating candles do you want to display? A single floating candle will look extremely elegant and is a good choice for small and intimate dinners or gatherings whereas a larger number of floating candles will make an impressive floating candle centerpiece. It is essential to decide on this before making the candle holder as this will affect the size of holder required. Theme - some floating candle holders can be decorated or embellished to complement a theme of a party or decorative style. Pebbles or colored glass, for instance, can be placed inside the candle holder to add color and additional interest. Larger or tall candle holders are better for this type of display. Situation - the situation will affect the type of floating candle holder that you use. A candle holder that is to be placed in a busy room will need to be more stable and robust than than one used at an intimate dinner party. Floating candles make a beautiful candle display. Creating your own candle holders can be the perfect way to create your own individual style.